Convertible coffee tables are versatile pieces of furniture that can transform from a coffee table into a different kind of table when you need one. These unique coffee tables can serve many functions. They can also be very stylish and make interesting conversation pieces. Desk-coffee tables are perfect for students or those who have to bring their work home with them. The spring-loaded top of the table lifts up to 31 inches high and slides towards the sofa or chair you're sitting in by 15 inches. This gives you a perfect work area for homework, paperwork or a place to set your laptop computer. There is extra storage space inside the table. You can also use this table to eat off of while you watch TV, eliminating the need for a TV tray. 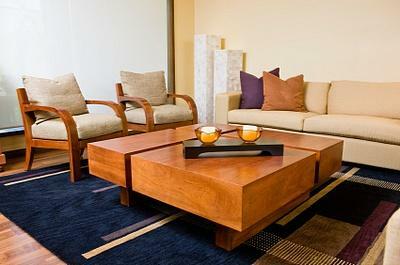 Dining-coffee tables are designed for the dual purpose of serving as either a coffee table or a dining table. There are a couple of different designs for this type. The first design is similar to the desk-coffee table in which the top of the table raises up and unfolds on each end, giving you a larger surface area to eat on. The second design uses convertible table legs that can be positioned low for a coffee table or higher for a dining table. Some of these convertible tables are small, more like end tables. They have two leaves on either side that fold out to make a longer table where guests can place their drinks and snacks. Other designs look more like larger, standard coffee tables. You could also use this style of table for craft projects or jigsaw puzzles. There are many benefits to furniture that transforms. This type of furniture is especially useful in studios, small apartments, dorm rooms and for renters who may have to fit all of their furniture into one room when they rent rooms from homeowners. These convertible tables eliminate the need for multiple pieces of furniture and some provide extra storage space as well. Convertible tables are also popular with those who want to live a greener lifestyle. This type of furniture cuts down on consumption because you have one piece of furniture that has multiple uses. Another nice thing about convertible tables is that they come in several different styles. You can find tables that look more traditional and you can also find tables that look very modern. Of course there are many contemporary styles available as well that will easily fit in with any type of décor. Most convertible tables are made out of wood or some type of wood veneer. You can also find tables made out of metal and glass. As you can see from this small sampling of online retailers, these transforming tables come in many different shapes, materials, styles and sizes. With so many choices, you should be able to find the right table to suit your needs. Be cautious when buying furniture that you need to be functional as well as stylish. A recent review written by Charlie Sorrel and published on Wired reveals the convertible desk design coffee table by Hammacher Schlemmer has a design flaw. The 31 inch high desktop is actually too high to comfortably eat from or work from while seated on a standard height sofa or chair. A better option might be the functional coffee table from Bo Concept. It's important that you take measurements any time you buy new furniture. For instance, if you're planning on buying a coffee table that converts into a desk, sit on your sofa and try to figure out what height level would be ideal for trying to work on a laptop or write on paper. Have a partner help you measure from the floor up to where you estimate the desktop should be. Once you have this measurement, try to find the convertible desk/coffee table that is closest to your estimate. Knowing what type of dimensions you need ahead of time will help you make better decisions before you buy.